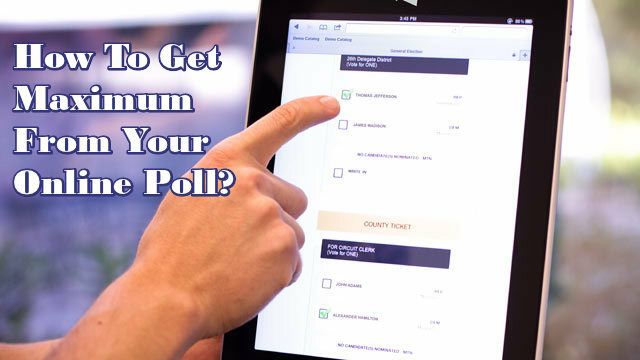 Home » Blog » General » How To Get Maximum From Your Online Poll? How To Get Maximum From Your Online Poll? Online survey has become the backbone for any business decision-making. It provides the feasibility to the respondents to reply as per their convenience. New and advanced online poll have the facility to customize and integrate elements. Usage of multimedia and customization has increased the response rate of online survey. Launch a successful campaign to achieve success, gaining maximum response from your participants. Your audience should be fully aware and convinced about your survey if you want to get the most accurate and reliable information from them. Apart from adding email mailing lists, you can also feature article to web communities and newsgroups. Try to make all your email invitations personal to get maximum response from the participants. According to a rough estimate, a personal salutation can increase the response rate by five per cent. Keep your email invite short and precise to make it engaging for your audience. Your email must give proper information about you and the purpose for conducting the survey. You should tell your participants about the benefits of survey for them. Give a link in your survey which will directly take your participants to questionnaire without wasting their time. Let them know the time which they will have to devote in order to complete the answers for the survey. Your respondents should be aware about the use which their response will be put to. You should make it clear to them whether you will make their name public or keep it anonymous. Though it seems a small thing, this can be a significant factor in getting fair and reliable information from the participants. You can send gentle reminders to your audience if you do not receive reply from them. You will surely not get reply from all the participants to whom you have emailed, this process will increase the response rate. Reminder is good but do not annoy your audience as it can bring down the numbers of participants and give you less information. Remove those respondents from the list who do not want to be disturbed and send reminders only to those who welcome it. Give some incentives to those who complete it within stipulated time frame to motivate them. Your respondents would love to get some incentive such as money, gifts or prizes. Even a small token of gift or certificate will increase your survey’s response rate. There will be participants who will reply to your questions even without a push but there will be shirkers who would need a push. Do not go for excessive fancy graphics as it can distract your audience from the online poll. Use proper and engaging graphics to improve the overall experience of your survey and increase the response rate. Just remember that asking the right question to the right person at the right time can only give you the right result. PollDeep, the ultimate online poll creator can help you design and conduct the most relevant poll for your business. With latest features and technology, PollDeep has everything which makes it a strong and comprehensive poll creator. So trust your intuition and conduct an online poll, your business will never be the same again.